Man City defender Kyle Walker deleted a tweet mocking Man United on Sunday, after his side thrashed the Red Devils with a convincing display in the Manchester Derby. Man City largely dominated proceedings from start to finish, and Jose Mourinho’s side could do little to try and stop the Citizens keeping their 2 point lead at the top of the Premier League table. 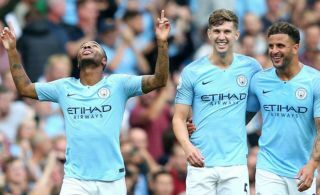 Goals from Sergio Aguero, David Silva and Ilkay Gundogan were enough for City go get one over on their arch rivals and maintain their unbeaten start to the league season. Walker took to Twitter after the game to post a tweet mocking United after they were beaten by his Man City side, however the England international was quick to delete the tweet. 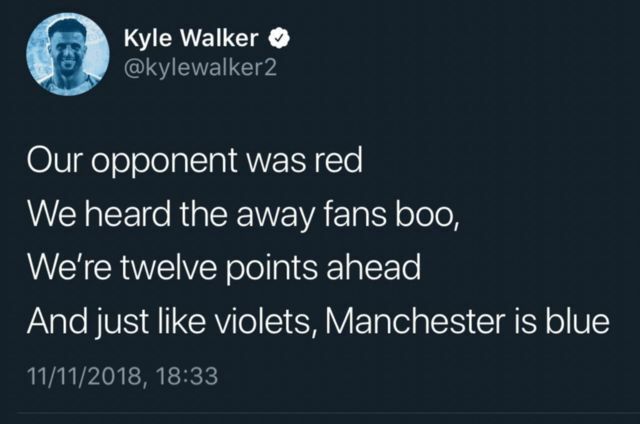 Walker’s poem was loved by Man City fans, however they only had a few moments to read it, as he deleted the tweet soon after posting it on Sunday evening. Given how heated the Manchester Derby has been since Pep Guardiola’s arrival at Man City, we’re not surprised to see tweets like Walker’s, we also quite like the creativity in it as well. It remains to be see why Walker deleted the tweet, however we’d love to see things like this from players in the future, especially in the format that this tweet is in!